Ronald M. Garl 1996 18 72 7044 60 minutes from downtown. 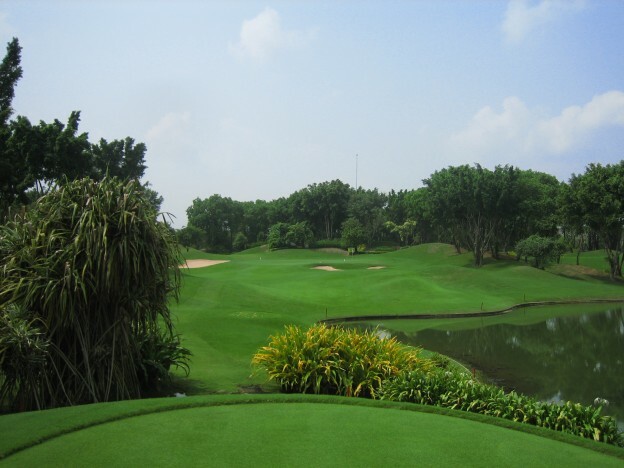 Alpine Golf and Sports Club – a Bangkok golf course defined in superlatives, exciting, beguiling, charming, groomed and gracious, it provides a marvelous aggregation of superb architecture, elegant landscaping, excellent routing, exceptional diversity and immaculate conditioning. Designed by Ronald M. Garl and opened in 1996 this magnificent private members golf course played host to Asia’s premier golf tournament, the Johnnie Walker Classic in the Millennium year 2000 won by Tiger Woods, therefore it is really not surprising that Alpine Golf and Sports Club was chosen once again to host the Johnnie Walker Classic, Asia’s premier golfing event in 2004. Alpine Golf and Sports Club is arguably Thailand’s finest golf course and possibly the best in Asia, the golf course is truly magnificent, laid out over flat terrain. Alpine Golf and Sports Club is without doubt a challenge for the amateur and professional golfer alike, all of the holes are particularly well planned with a good arrangement of water hazards, the greens and fairways are well maintained and will always be found in excellent in condition. A round of golf over this magnificently maintained course will be a truly memorable experience that will be talked about in the years to come, Alpine Golf and Sport Club’s impressive clubhouse has excellent facilities including an exceptional international restaurant.